Always wanted to explore different techniques for drawing and painting the figure and objects? 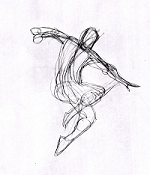 We’ll experiment with action and gestural drawing methods, designed to develop your observational skills and loosen up your approach to drawing. Beginners and those with experience both welcome. Through action and gestural drawing techniques, such as contour drawing and drawing the figure in motion, we’ll experiment with traditional and non-traditional drawing and painting tools and mediums to create expressive line and marks. By observing the figure, objects and our surroundings we’ll look at different ways of depicting these through full body action drawing. There’ll be a lot of quick drawing and painting so be prepared with lots of paper on hand. We’ll also look at some historical and contemporary artists who employ some of these techniques in their art practice. The aim of the course is to provide a relaxed environment in which to explore many different drawing techniques without the expectation of a finished artwork and to give you the tools to expand on the skills you develop in your own time. It can be incredibly rewarding to learn to draw the figure or an object fast and it’s satisfying when you discover that you can capture proportions using these gestural techniques. Open to all abilities. Some out of class work will be encouraged. Bring a pad of A3 paper and drawing materials such as pencils and charcoal.